Every year on the program I do a "best of the year" music special with a Top 10 list, and my pick for the best record of the year becomes the Classic Album of the Week. Often I complain that there are only a couple of great records amid a sea of crap, but this year I actually had to expand my list of honorable mentions from 15 to 25 because I heard so many good records! (though maybe that just means I am getting better at finding stuff.) However, I wouldn't say that anything I heard this year was as groundbreaking as some past year's selections (like Scott Walker's The Drift.) 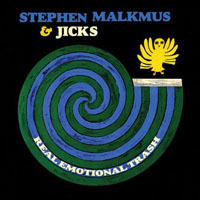 Still, Steve Malkmus' fourth post-Pavement release proves he is one of the last great songwriter/musicians in the rock and roll universe -- as good a band as Pavement was, Malkmus' muse today is stronger than ever, and the current lineup of his backup band the Jicks is a real powerhouse (adding ex-Sleater Kinney drummer Janet Weiss was a stroke of genius.) While his lyrics are getting more obtuse than ever, SM has cooked up a batch of superb 6-to-10 minute guitar jams for his latest, the likes of which haven't been heard since the glory days of the early 70's. Here are some recent live clips of songs from Real Emotional Trash: "Dragonfly Pie" featuring the Jicks and "Wicked Wanda" performed as a solo acoustic number. "Baby C'mon" is a rocker from the previous album (#3 on my Top 10 of 2005), and here's Malkmus doing another solo acoustic rendition of the epic "No More Shoes". Finally, here 's Pavemnt doing "Trigger Cut" from their classic Slanted & Enchanted album of 1991.